Yesterday I took a day out to visit Anne Hathaway’s Cottage in Stratford-Upon-Avon, Warwickshire: it was part of a birthday treat for my mum – although it was a treat for me too of course! What has all this to do with either Hugh or the 14th Century I hear you cry? After all, Shakespeare was more than a good couple of centuries later. Well, yes, OK, that’s true enough – but some things that still exist from Shakespeare’s time can still show a glimpse of life in earlier times. Certainly when it comes to practical, everyday objects that no longer exist from two centuries earlier but must still have been used in some form. After all, things a few hundred centuries ago did not tend to change as rapidly as in post industrial-revolution times. Hence, at the cottage (and thanks to the wonderful and knowledgeable woman guide we had there), I discovered something that I had not heard of previously, and, presuming that (hopefully, otherwise I’ll look an idiot), I am not the last to know this piece of information, I thought I’d share it. 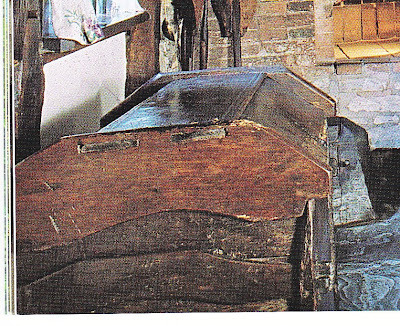 In the kitchen was something that looked like a very robust sideboard with a lid that looked a bit like an up-turned trough. It wasn’t in any way decorative and so was not a high status type of furniture that was meant to be on show. Upon noticing my interest in it, the guide told me what it was: an ark. Now, if you’re like me, the name ‘ark’ makes you think of Noah, a rather large boat, a lot of water and animals going in two by two. Or alternatively ‘the Ark of the Covenant’ – a rather mysterious but holy box that also popped up in an Indiana Jones film. In any case, an ‘ark’ was an important biblical object and certainly not what you’d expect to find in an Elizabethan (or earlier) kitchen! Of course, on getting home, I did some research and discovered that ‘ark’ actually means a chest or box (even a coffin) that protects something. So it seems that the odd one out of all of our arks was Noah’s – the name being a metaphor for his ship safeguarding the life on earth from the Flood. Anyway, back to the ark in the kitchen. This was in fact, I was informed, a flour ark. It was used to store flour for the daily bread making – and bear in mind that in a farmhouse, with a large family and a workforce, alot of bread would have been baked each day. The lid, which was not attached to the body of the ark in any way, would have been lifted off, turned over, and used in the breadmaking process, i.e. the mixing and kneading. The height of the ark, with the lid used in such a way would have been perfect for the task. The body of the ark was, as the guide informed us, the original ‘flat-pack’ furniture. Held together by removable pegs, the whole thing could be taken apart to be cleaned – something that would have been essential in the storage of something so easily spoiled as flour. Of course, at this point it occurred to me that, just as the Elizabethan household would have had a need for mass bread making, so would the Medieval household. Could they have used something similar? The guide seemed certain of it. 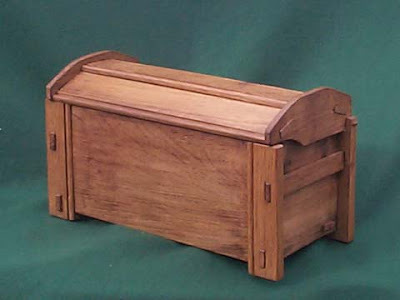 Ark chest (thirteenth to eighteenth century). These were a variation of the clamped front forms that were usually, but not exclusively, used for the storage of grain or bread. The lid was not originally hinged or fixed to the base. This allowed the lid to be removed and used as a kneading trough or handbarrow. It is different from the one in Anne Hathaway’s kitchen in that it is much smaller and the restraining pegs are in different places, but the principle is the same. Interestingly, the author doubts that flour could have been kept in large flour chests as it would spoil too easily. Instead he speculates that the chests held grain instead. Although he does have a point about flour spoilage, as I have said above, it would have been used up pretty quickly in such households in earlier periods due to the importance of daily bread. Also, grain was generally not milled in the kitchen but at mills, so what would have been the point in storing grain, only to have to have it taken away again to the mill before it could be used? Also, with the advantage of being able to regularly take apart and clean the wood, flour would not have spoiled or accumulated pests. Anyway, that is all that I can find on this piece of furniture for now. If anyone knows any more or has pictures of other examples, please let me know. Tagged Anne Hathaway's Cottage, flour ark, kitchens, Shakespeare. Bookmark the permalink.